Understanding NCEA information from NZQA website. To help parents and employers better understand NCEA, NZQA has developed an app designed for mobile devices - phones and tablets. 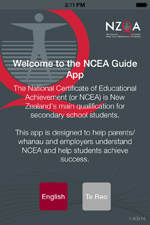 Called NCEA Guide, the app is for parents, whānau and employers and provides quick and easy access to key information about NCEA. NCEA Guide includes key content about the structure of NCEA, how the qualification is used after studying, how credits work, and how endorsements are earned. Users can also choose to view the content in English or Te Reo. Importantly, parents and whānau can also get information about how they can support family members studying towards gaining their secondary school qualification.